This penultimate issue of WicDiv‘s Imperial Phase arc is heavy on setup and light on action. This is, however, a-ok because 1: there’s still a delicious tension running through the narrative and the characters’ interactions, and 2: the issue plays around with some super cool stylistic choices with both storytelling and art. The members of the divine ensemble break off on their own or into smaller groups in issue #27, everyone examining (or not) the threats internal or external. 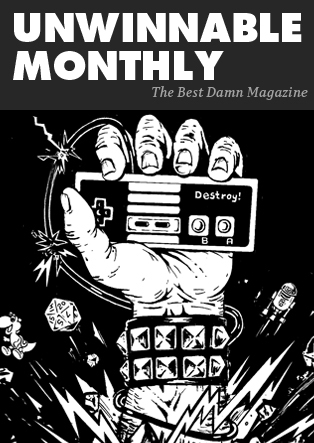 We’re reminded that some of the gods have entered their “imperial phase,” the last year of their ascendancy, and may be understandably more concerned about their impending deaths than the threat presented by the emergence of The Great Darkness. Others (the noobs) are more worried about that Medusean, anthropomorphic bug-cloud, and others still are focusing (or not) on figuring out themselves. The middle of the book is an amazing exercise in form – two-page spreads are divided into sixteen panels, with smaller groupings telling the parallel and sometimes intersecting stories of our major players. I’ll admit to finding the first spread confusing to read, but I quickly picked up on the visual shorthand (look to the borders!). It’s a fun, quirky way to catch up on the goings-on of a fairly large group of characters, and it’s unlike anything I’ve seen in comics before. McKelvie also sprinkles pop culture references into some of the artwork, with Baal and Minerva striking some familiar superhero stances, and Cassandra adopting one of the funniest poses in anime in the section focusing on her study of Ananke’s now destroyed machine. It’s been a long time since I literally lol’d at a comic book, but that particular move is just sooo Cass. 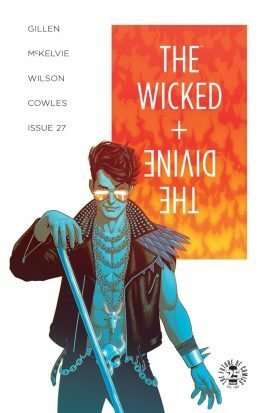 That’s the pleasure of sticking with a book of The Wicked + The Divine‘s quality – even the plot-establishing issues deliver genuine delights. I trust next month’s finale will deliver the action some may find missing here, but with clever, engaging, and amusing storytelling and artwork like this, I wouldn’t mind if the end of the arc turned out to be more whimper than bang. That is the way the world ends, isn’t it? One of the things I’ve loved about Hellboy comics is that so many of the stories grow out of folklore. Faeries, demons, the Baba Yaga and so many more populate Hellboy’s world. It’s a rich tapestry of myth. 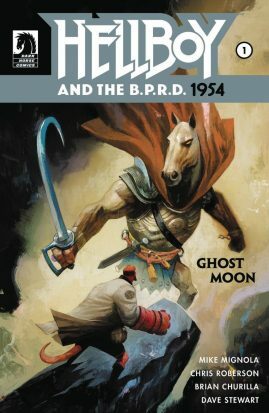 Hellboy and the BPRD 1954: Ghost Moon # 1 is the latest entry in the tradition that gave us The Corpse and Hellboy In Mexico. Ghost Moon explores a Chinese supernatural legend – something we haven’t seen much of in Hellboy’s pages. The story begins with the BPRD being dispatched to Hong Kong as a favor to one of Professor Bruttenholm”s friends, Lady Cynthia. Upon arrival, they meet an MI-5 type who, along with two paranormal experts,was looking for a mystical Hunping (funeral urn). Their clandestine search didn’t go well. Enter psychic Susan Xiang, Hellboy and Hellboy’s field agent pal, Archie – agents of the Bureau for Paranormal Research and Defense. The story is a mix of myth and Cold War intrigue, though it’s a little heavy on the exposition. That said, Roberson hasn’t had a stable art partner on Hellboy and the BPRD, so pro that he is, it seems like he’s scripting in the interest of clarity, which is welcome. Chris Roberson writes some damn fun comics and this is right up there with Edison Rex and his Superman/Batman arc. This is Brian Churilla’s first work in the Mignolaverse. It’s an impressive entry. He captures that Mignola monster book mood while maintaining his own style throughout. Churilla’s storytelling has a constant forward momentum once Hellboy, Susan and Archie arrive in Hong Kong. As they move towards the Walled City, the panels and characters consistently move in one direction. The only time this deviates is when their path is blocked by two ugly monsters . It’s a subtle shift, but it keeps the reader moving from left to right. It helps keep the book moving during its more expository moments. I dug this issue and I’m looking forward to seeing the second and final chapter of this arc. Roberson and Churilla work really well together. I hope they become a more stable team on the Hellboy and the BPRD series. They have a lot of creative potential in Mignola’s world.